Who can predict when an injury from an accident will occur? No one can. But we can all predict that the treatment can be costly. 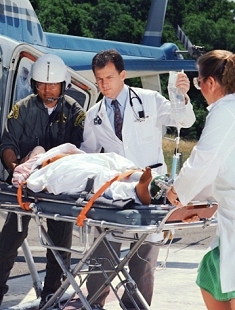 An emergency room visit can cost thousands of dollars for x-rays, tests and treatment by emergency personnel. Add to that the expense for emergency transportation to the hospital by ground or air ambulance and the total can be a staggering sum. Although you can't predict when an accident will occur you can plan for it now by enrolling in a personal injury accident insurance plan such as NACD's 24-Hour Accident Insurance Plan. The personal injury accident insurance policy offered by NACD covers the costs of medical treatment for your injuries including loss of limb or eyesight. This is 24 hours per day, 7 days per week coverage no matter where the accident occurs - at home, at school, on the job, even outside the country! Payment of medical expenses required for medically necessary treatment of a personal injury includes care in an emergency room or hospital room, dental work, drugs and medicines, and rental of medical equipment. Click the above link to obtain a free quote and enroll in the plan online.